As the presenters at a racehorse retirement conclave in Saratoga Springs, New York, outlined their strategies for protecting racehorses after they leave racing, Grand Strand (pictured above), one of those would-be retirees, was settling into a Pennsylvania quarantine stall after he was swooped from a kill-buyer's bid the day before at the horse-hell known as "New Holland." Three days after the daylong meeting that applauded how New York's racehorses are placed after retirement, NY-bred Morning Herald went through the Unadilla, New York livestock auction where a woman and her 15-year old daughter outbid a handful of kill-buyers. On Sept. 1, the New York State Gaming Commission's Retired Racehorse Summit proceeded live (and online) at the elegant Fasig-Tipton sales pavilion. One panel covered Standardbreds and harness racing, the rest of the program focused on Thoroughbreds. Where million dollar thoroughbred yearlings sold a few weeks before, the summit's presenters outlined their goals and talked about funding thoroughbred retirement in terms of millions of dollars. Speakers from organizations representing New York's thoroughbred racing industry outlined their plans to stream hundreds of thousands of dollars to theThoroughbred Aftercare Alliance (TAA) that gives grants to over 40 racehorse retirement groups, including six facilities in New York. Grand Strand at the New Holland auction. Photo courtesy of Omega Horse Rescue At the same time as the summit, the downward spiral, then rescue of Grand Strand played out on social media. It turns out he was spotted and identified the day before the summit, Monday, August 31, at the New Holland, Pennsylvania, horse auction. 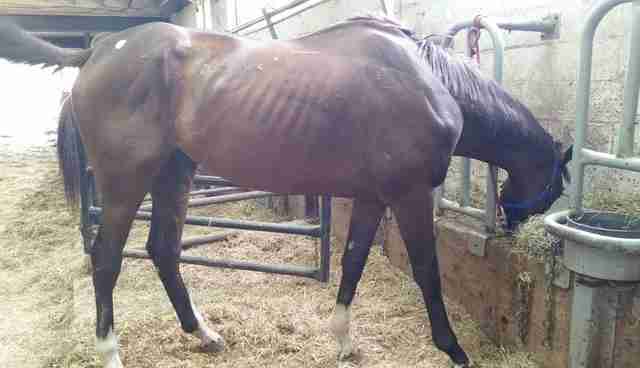 He was found by a representative from Omega Horse Rescue, who attends that auction to pluck former race horses from the maw of horse slaughter. The spotter alerted Mindy Lovell at Transitions Thoroughbreds. Lovell identified him by his tattoo and committed the funds to buy him outright at the auction. She knew the Canadian slaughterhouses needed a high number of horses to fulfill contracts that week and a horse like Grand Strand could easily disappear onto a truck heading north. Morning Herald stands at Unadilla auction. Photo courtesy of Little Brook Farm Late afternoon, Sept. 4, Morning Herald was tied in the back of D.R. Chambers & Sons auction in Unadilla, New York. He whinnied to a teenage girl who was at the sale using her 15th birthday money to buy tack for a rescue, not a horse. After she went over to see him, plans changed. 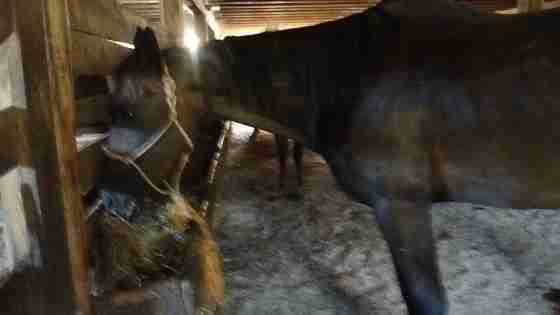 She enlisted her mother and they resolved to buy the friendly, big brown horse who was back-tagged for slaughter. There was no way they were going home without him. They checked his lip for a tattoo, there was one, but they were unable to identify him before the sale; afterward he was identified with the help of a veterinarian and theJockey Club. Once Morning Herald entered the ring, it was between mother-and-daughter and the kill-buyers, no one else was bidding. When the price reached $460, the auctioneer dropped his hammer on the mother's bid, at almost twice the going rate for meat-horses that night. With the Coggins blood test and auction fees, the total came to $537.40; shipping to East Chatham cost $80; veterinary costs are still accruing. After learning about Morning Herald's plight, a good Samaritan has given money to cover initial veterinary costs. Grand Strand spent most of his career on the highly competitive New York Racing Association circuit of Aqueduct, Belmont and Saratoga. He won a couple of lower level claiming races. Through claims, he changed owners from Centennial Farms to David Jacobson to Nicholaos Panapoulos. His last race in New York was May 3, 2015, he came in fifth in a Belmont Park claimer with a $14,000 claiming tag. Grand Strand then moved to Parx Racing in Bensalem, Pennsylvania, for his final four races. His last race was July 12, 2015, he came in fourth earning $1,080. The official race chart'scomments on his performance are: wide, stalked, gamely. 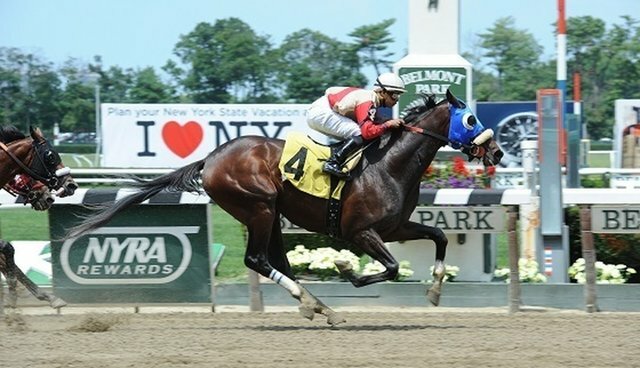 A 2008 son of the hard-knocking multimillionaire racehorse Say Florida Sandy, Morning Herald won $96,887, racing his whole career for Everett Estabrooks' Whitestone Farm. He won three races in the last and best year of his blue-collar career. His final race was Dec.1, 2014; he earned $315 for fifth place. Grand Stran The path taking Grand Strand to New Holland is unclear. On July 20, 2015, Grand Strand's trainer Ramon Preciado signed him over for $1 to used car dealer Salvador Dip of Freehold and Elizabeth, New Jersey. Grand Strand's trail is documented to the transfer to Dip, after that it disappears until New Holland. While in quarantine, Grand Strand will be evaluated and treatment started for any rehabilitation. He'll be vaccinated, checked for parasites and treated accordingly. 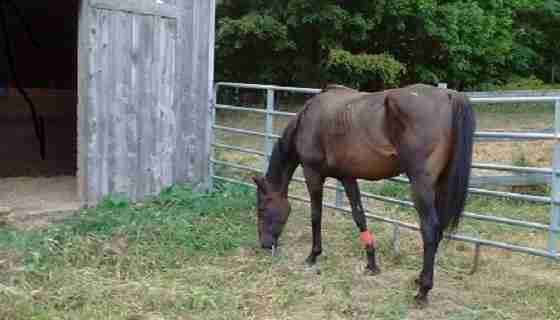 After quarantine he will travel to Lovell's farm for training and a career as a riding horse. Upon finding out the plight of the horse he had recently given to Dip, former trainer Ramon Preciado reimbursed Lovell for Grand Strand's purchase and quarantine costs. Years ago, a former Preciado-trained gelding Little Cliff ended up at New Holland and was rescued. Uproar over the near-fate of the popular Little Cliff initiated the Turning for Home racehorse retirement and rehoming program based on the grounds of Parx. Morning Herald picking at grass in his quarantine pen. Photo courtesy of Little Brook Farm There is no trail of how Morning Herald went from being a barn favorite at Finger Lakes to the Unadilla auction. Through the kindness of a shipper, friends and the guidance of Lynn Cross from Little Brook Farm Horse Rescue, the teenager and her mother brought Morning Herald home to East Chatham, New York and are taking care of his quarantine. His veterinary evaluations show a recent substantial wound, a slight soreness in his hind end and overall neglect. When Morning Herald's former owner Everett Estabrooks was contacted, he couldn't remember to whom he gave the horse. Estabrooks did know that between the time he gave away Morning Herald and he appeared at Unadilla, the horse changed hands "three times." Both Parx and Finger Lakes racetracks have on-site retirement and adoption facilities; the Finger Lakes Thoroughbred Adoption Program is accredited by and a grantee of the TAA. There has been no reason given why Grand Strand and Morning Herald weren't sent to their respective retirement programs. Grand Strand's and Morning Herald's examples are merely two of an unknown number of racehorses and former racehorses, that while eligible for aftercare programs, still fall through the cracks by no fault of their own. They are young, sound, healthy (aside from neglect), and good-tempered, not what you would think of as cast-offs.